February 15, 1929. The Coroner's Jury who investigated the massacre. The latter two gentlemen (Burt A. Massee and Walter E. Olsen) ponied up their own money to have Calvin Goddard solve the crime through ballistics. Bullets removed from the bodies and what they look like today. 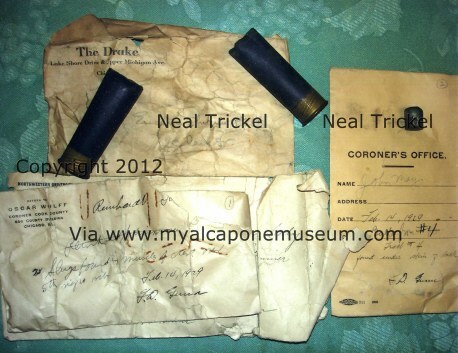 This time capsule evidence was uncovered back in 2012, in some old trunks Neal Trickel was hanging on to. 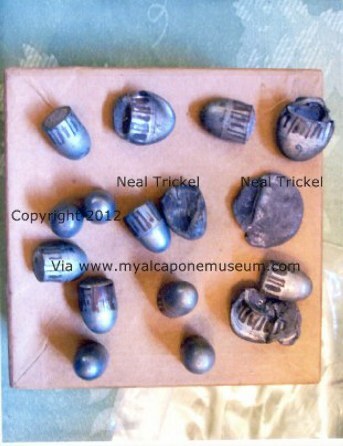 Bullets from Fred "Killer" Burke's cache found during a raid. 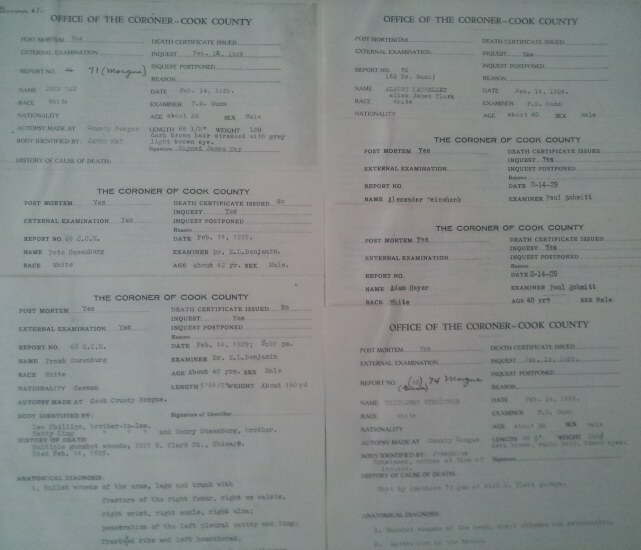 These were tested and cross referenced by Major Calvin Goddard, a ballistics expert that was hired by Chicago business community to solve this heinous crime and finally bring some respectability to their beloved city of Chicago. Since that crime, tourists were very leery about visiting Chicago and spending money. 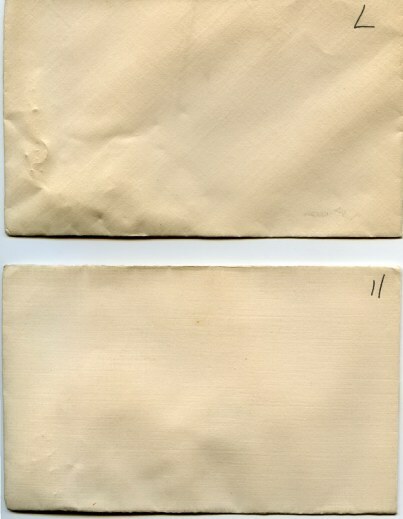 Some evidence envelopes. 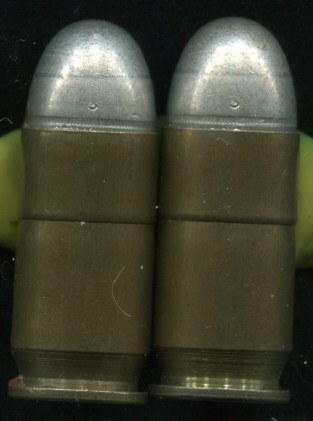 Here are two spent shotgun cartridges picked up at the massacre scene. Complete list of all bullet and bullet fragments picked up at SVD crime scene. 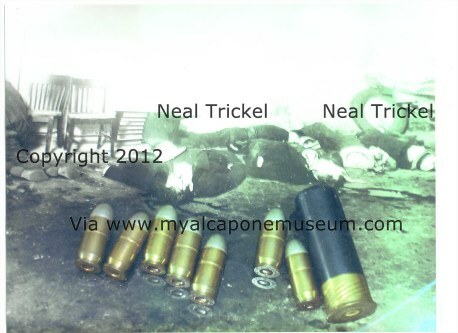 Along with the whole bullets, there were bullet fragments found on the floor that had gone through the bodies and hit the wall. 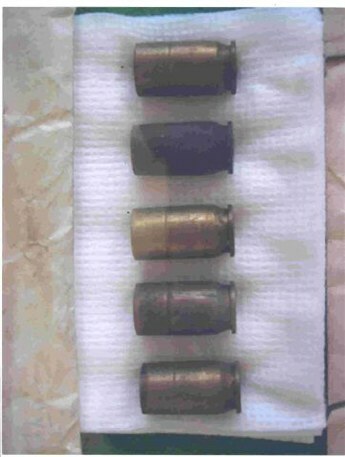 These were collected by Goddard's team and placed in envelopes as the above.These were unusable by Goddard and the forensic team during ballistics. They had enough whole bullets to tie the machine guns to the shooting. Massacre, both manufactured by the U.S.
friend of Joe and his brother Allan Wilimovsky. (Photo by Neal Trickel and info by William J. Helmer). Coroner's autopsies diagrams for each victim who died in the 2122 North Clark Street garage. 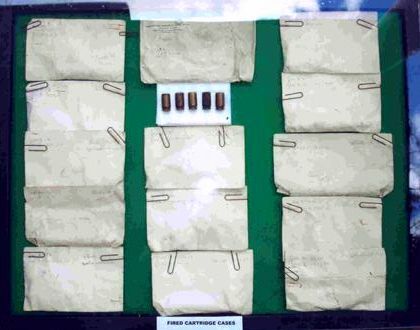 Evidence envelopes from top left to right then bottom left to right. James Clark, John May and Reinhardt Schwimmer. Calvin Goddard's evidence from the crime scene. Here are the complete amount of spent .45 caliber shells that were picked up. 14 envelopes with 5 shelss each total 70. Goddard had figured out through forensics that 20 bullets came out of one Thompson and 50 came out of the other. One drum and one stick mag. Many had exaggerated the massacre with hundreds and thousands of bullets. In reality only seventy .45 acp rounds were fired along with two shotgun blasts. Close up of spent shell picked up at the scene. 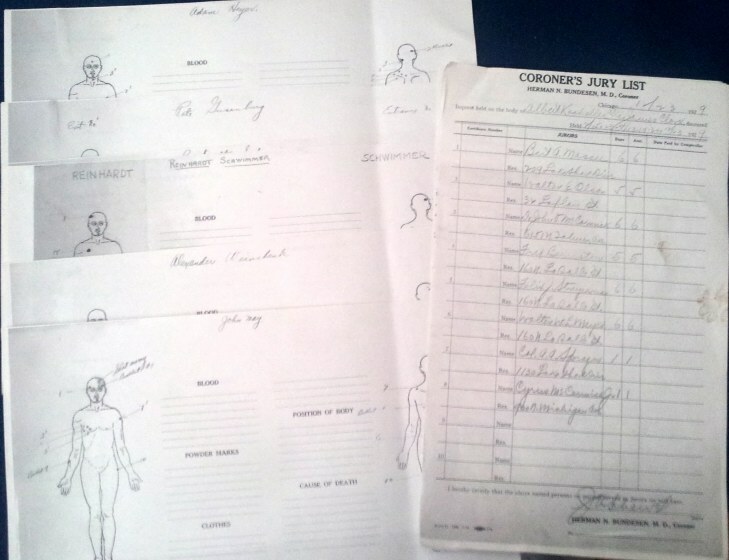 Coroner's reports on autopsies performed on each victim of massacre. Three Medical Examiners performed the autopsies of the seven men. Dr. E.L. Benjamin, Examiners F.D. Gunn and Paul Schmitt. 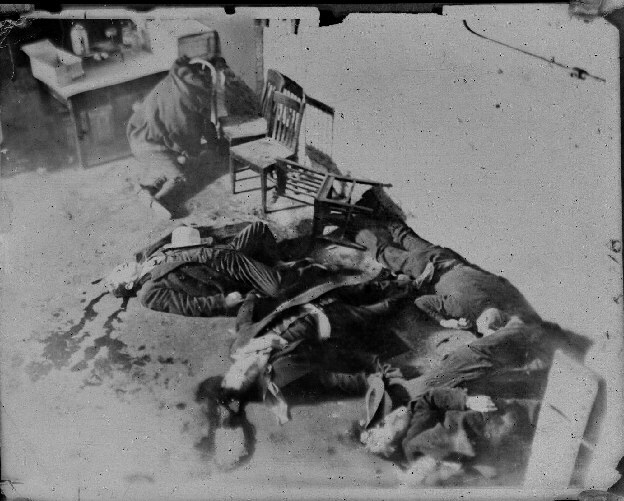 The St. Valentine’s Day Massacre exceeded any gangland killings before or after February 14, 1929, throwing the city into a frenzy of police activity, awakening the Chicago Crime Commission, and dismaying civic-minded businessmen who were tired of hearing their city called the world's “gangster capital.”Coroner Herman Bundesen, wielding more authority than any medical examiner before or since, virtually took charge of the case and immediately selected a “blue-ribbon commission” of leading citizens who became part of a special grand jury that would attend a year’s worth of hearings.The hearings accomplished as little as the police investigations, except in one respect. 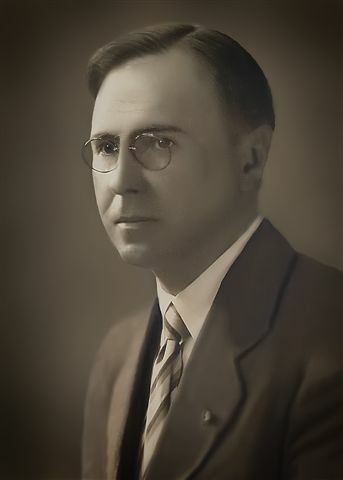 Bert Massey, vice-president of the Colgate-Palmolive-Peet Company, had heard of a New York “criminalist” named Calvin Goddard who was introducing the new science of forensic ballistics into the court case of Nicola Sacco and Bartolomeo Vanzetti, the self-described anarchists already convicted pulling a 1920 payroll robbery in South Braintree, Massachusetts, killing a paymaster and a guard in the process. Goddard was hired late in the game to microscopically examine the striations on the death bullets and bullets test-fired from the guns of both foreign-looking and foreign-acting men. 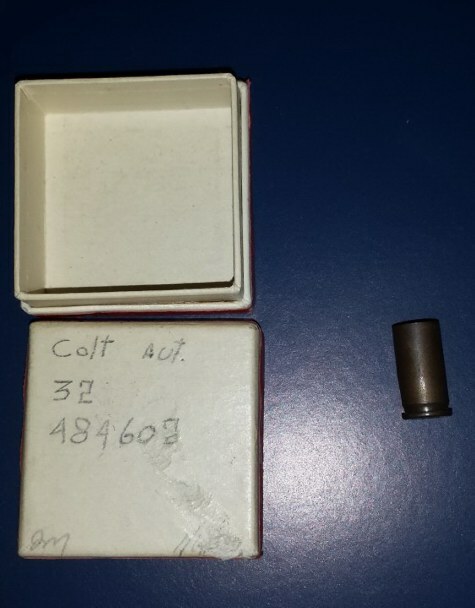 He established that the Colt .32 automatic found on Sacco at the time of his arrest, but not Vanzetti’s .38 Harrington & Richardson revolver, had fired the fatal shots. But such “ballistics” evidence was too arcane for the appellate court, and most citizens already believed that "anarchists" were bent on destroying America, so in 1927 both Sacco and Vanzetti fried.Two years after that the City of Chicago was too preoccupied with closing speakeasies and arresting “the usual suspects” to give much thought to science or spending money on it; but Massey had been sufficiently impressed by Goddard’s work that he enlisted support from Walter Olson, president of the Olson Rug Company, and they used their own funds to hire Goddard’s services. Goddard immediately left his private laboratory in New York in the hands of two collegues and began setting up an even more elaborate lab in Chicago to work on the Massacre. At Coroner Bundesen’s suggestion--because the police themselves were still suspects--a Scientific Crime Detection Laboratory was soon established under the auspices of the Northwestern University Law School, between Chicago’s famous “Water Tower” (a souvenir of the Great Chicago Fire) and the Lakefront...because nobody trusted the cops. Bureau of Forensic Ballistics in New York in 1922. A favorite of gangsters. 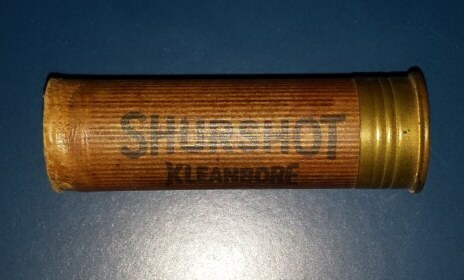 A shotgun shell tested by Calvin Goddard. 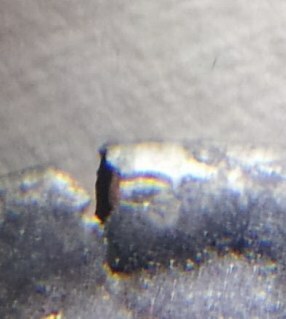 Close up of firing pin indentation. Goddard compared these and other markings the gun's hammer made to assess a link to a murder weapon. 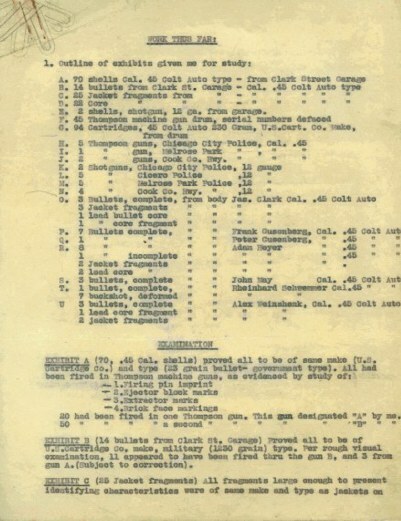 A .32 Auto tested by Goddard. 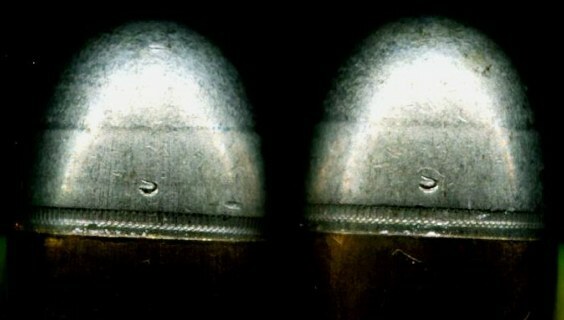 Bottom view of Goddard test bullet. Calvin Goddard examining a revolver barrel with the crime laboratory's helixometer. Calvin Goddard’s was a full-service laboratory, patterned partly after a lab established about two years earlier by August Vollmer in California and partly after laboratories long-established in several European countries. The Europeans were far ahead of the United States in most areas of forensic science; where they came up short was in ballistics. Their specialists (and Vollmer’s as well) had a basic understanding of the rifling marks on bullets, but for evaluation they still were wrapping slugs in tinfoil and trying to match them by studying the patterns with a magnifying glass. 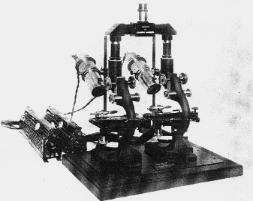 Goddard (who usually called himself major in stead of his war-time rank of colonel) employed a new split-image comparison microscope developed by Philip Gravelle, which was a pair of microscopes linked to a single eye piece and had two independently rotating posts instead of the mirror-and-plate arrangement that would normally hold a slide. Bullets mounted with wax on each post could be slowly turned until the nearly-invisible striations perfectly matched up--or failed to match up, if the bullets came from different guns.Goddard also used a “helixometer,” newly developed by John Fischer based on the medical cytoscope, and which could optically examine the interior of a gun barrel which would confirm its caliber, determine the pitch of the rifling, and examine it for powder residue. 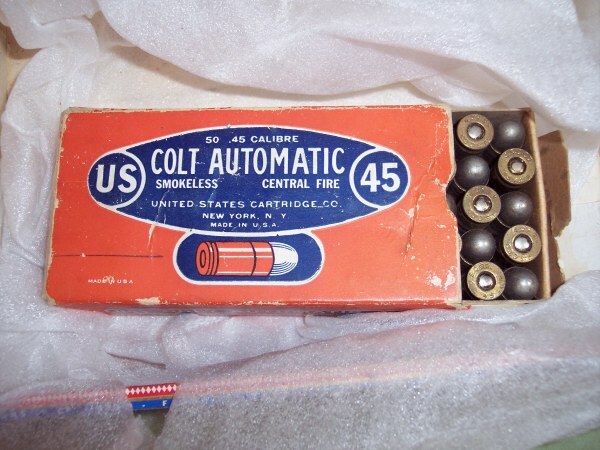 U.S. Cartridge Co. special "S" .45 Caliber rounds found in Fred "Killer" Burke's possession. 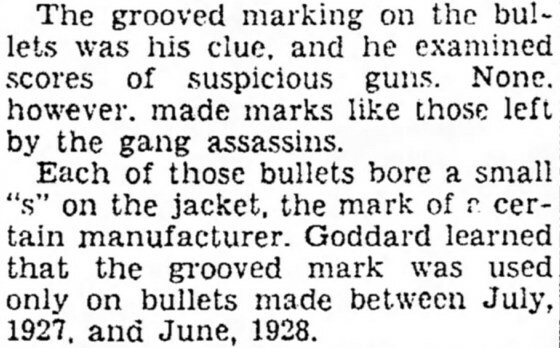 Excerpt from the Oshkosh Daily newspaper for April 2,1931, describing Calvin Goddard's examination of massacre evidence. 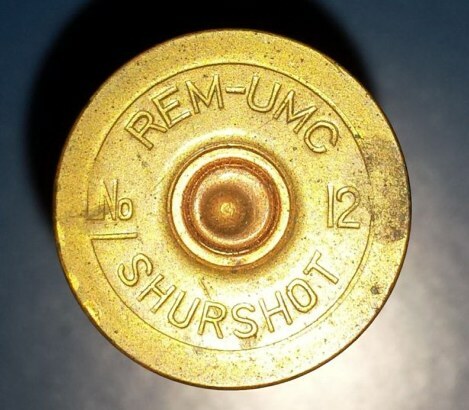 U.S. Cartridge Co. limited run "S" stamped rounds. 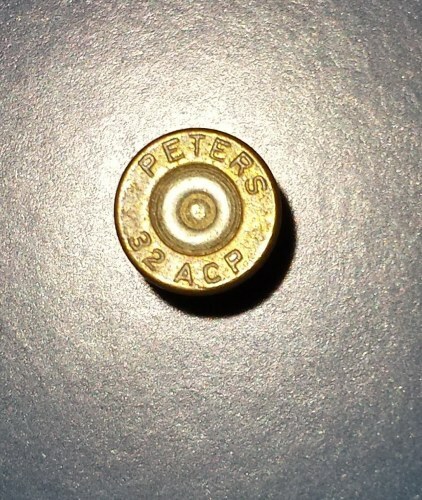 Close up of limited run "S" stamped rounds like the ones used in the St. Valentine's Day Massacre. Close up shows partial "S" stamp on jacket from limited U.S. Cartridge co. .45 caliber round that went through one of the massacre victims. Deadwood Pioneer Times November 22,1930. 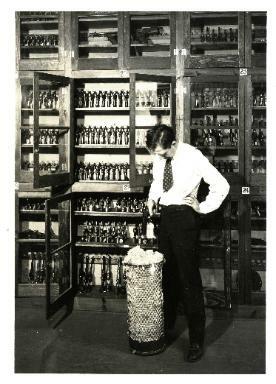 Fred Burke Tommygun, a box for United State Cartridge Co. cartridges siezed at Burke's house near St.
examined the Goddard laboratory in New York. (Photos / info by William J. Helmer and Neal Trickel ). 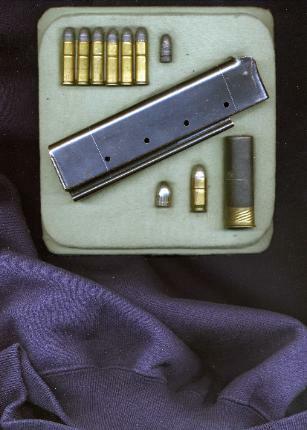 Riflings differed among manufacturers and usually were unique to a particular brand, model and caliber of handgun or rifle. 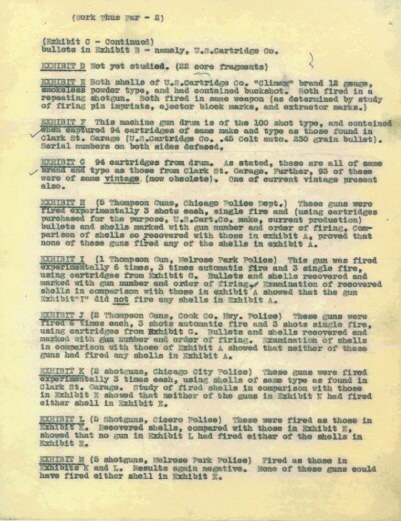 Shotguns had no rifling, but each gun still left marks on the primers and casings of their empty shells that were also unique to a single weapon.Using slugs taken from the Massacre victims and seventy shell casings picked up off the floor, Goddard first spent many hours explaining to Bundeson's "coroner's jury" the theory and practice of forensic ballistics; and then he established to their satisfaction that two .45-caliber Thompson submachine guns had been used, one with a fifty-round drum and the other with a twenty-round “stick” (or straight) magazine.Since at least two of the Massacre killers had worn police uniforms, Goddard obtained and test-fired all the Thompsons belonging to the police departments in Chicago and its suburbs. These were ruled out, and it was not until Berrien County's sheriff’s police raided a house near St. Joseph, Michigan, in December, 1929, and found an arsenal that included two Thompson guns.These were immediately delivered to Goddard’s laboratory for examination. Goddard found them to be the weapons used in the Massacre, and man who had possessed them, a Frederick Dane, who turned out to be Fred “Killer” Burke, had beat it out of town.Meanwhile, the New York police, working on the killing of Brooklyn gangster Frankie Yale a few months earlier, had traced the Thompson they had found in an abandoned escape car to a gun dealer in Chicago. Evidently they knew that two machine guns had been fired at Yale, and they figured they might have bullets from both. They also knew of Goddard's new crime lab in Chicago. So they took their gun and their bullets to Goddard's lab to see if anything matched up. And, sure enough, Goddard established that some of the bullets from one of the two New York machine guns--the one that had come back to Chicago--also had fired some of the bullets used in the Massacre.Besides advancing the science of forensic ballistics, coupled with shooting angles and distances, Goddard’s laboratory soon was doing hair and fiber investigations, discovering new chemistries for use in serology (blood), and employing the new “moulage” technique to make rubber-and-plaster casts of footprints and tire tracks. 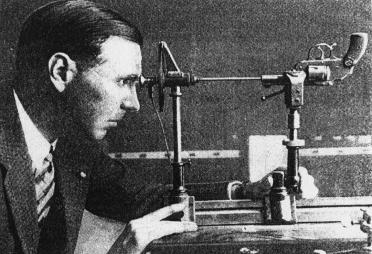 The lab even utilized Leonarde Keeler’s new “lie-detector” equipment, which could help police narrow their list of suspects (but which is still not admissible as courtroom evidence).Additionally, in 1931, the Scientific Crime Detection Laboratory set up month-long classes to train future criminalists, as they were now being called, one of whom turned out to be a “G-man” who took his knowledge back to Washington, D.C. There he provided J. Edgar Hoover with everything he had learned from Goddard to help set up a national crime laboratory some eighteen months later, using the same equipment and technologies. 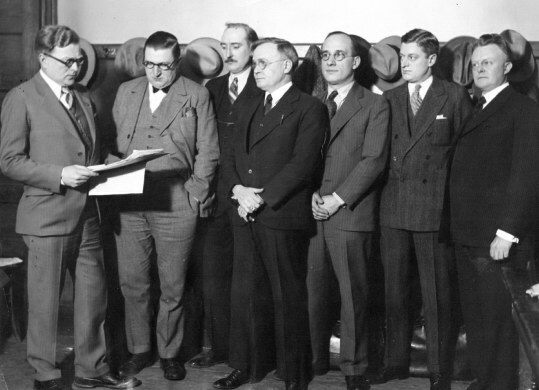 When FBI Director Hoover later chewed out Melvin Purvis for doing business with the Chicago lab, and otherwise ignored its existence, Goddard was really pissed off.After its initial financing by two wealthy Chicagoans, Massey and Olson, Northwestern University itself began funding the work of laboratory. This was partly offset by charging for services performed, but even that was not enough to meet laboratory expenses. During Chicago’s "Century of Progress" World Fair in 1933-34 the lab had to set up an exhibit and sell souvenirs, such as matchbox-size containers enclosing a bullet and shell casing from a "Machine Gun taken from Chicago Gangsters." (Any ol' gangster would do.) In the early 1930s, the laboratory outgrew its quarters at the Northwestern Law School in downtown Chicago and was moved from 469 Ohio Street to another Northwestern building at 222 East Superior. 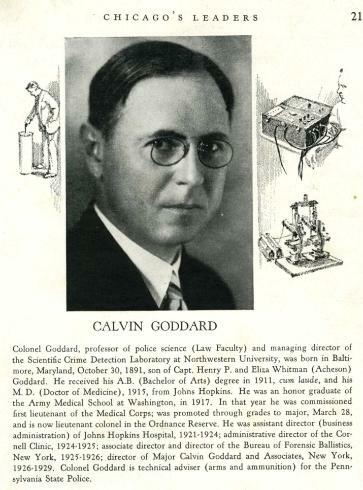 Calvin Goddard went back to New York, leaving the lab in the hands of Fred E. Inbau and a well-trained civilian staff. By 1938 the Chicago police had lost enough of its gangster-era stigma to purchase the facility for $25,000, including two chemical laboratories, a photography room and darkroom, a chamber outfitted with a “lie detector,” a document examiner’s room, a library that included some 1000 books on scientific crime detection, and an exhibits room containing many hundreds of guns and other implements of crime.Most of the civilian staff was employed to operate the police department’s lab, which had been relocated to the police headquarters building at 1121 North State Street; and when the department expressed a desire to replace these men with police personnel, Inbau began training officers who had at least some background in science.Meanwhile, Joe Wilimovsky, who also worked with the coroner's office, scrounged most of Goddard's personal files, photos and other items not nailed down, and with his brother Allan helped set up a similar crime lab for the State of Wisconsin. 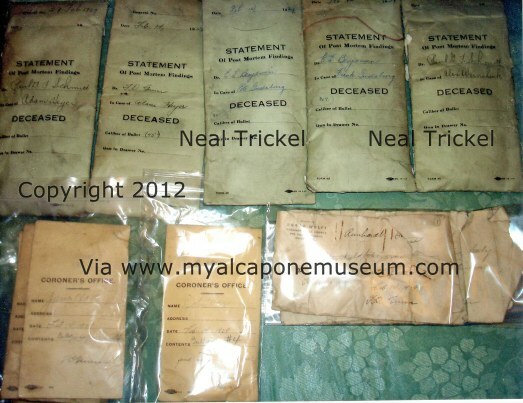 Eventually this material went to Wisconsin collector Neal Trickel, together with an original Dillinger death mask and mold. (From the mold, Neal, a hospital lab technician, plucked three eyebrow hairs that in 1984 he graciously donated to The John Dillinger Died For You Society's Doctor Horace Naismith, the nom de guerre of Your Benefactor. )One of the original crime lab’s major and lasting contributions was its American Journal of Police Science, first published in January-February, 1930, by the Northwestern University Press, and which has since been incorporated into the Journal of Criminal Law and Criminology, published originally in 1910 as an academic periodical and still widely circulated today. such employees as Joe Wilimovsky hired to train cops in its use. In those days, Real Men didn't bother with hearing protection. How did the St. Valentine's day massacre bullet evidence resurface after all these years when it was considered lost to the ages? These were once believed to have been destroyed in a basement flood over at the CPD. A Wisconsin collector, Neal, an old friend of William J. Helmer, is not only into Col.Calvin Goddard's Scientific Crime Detection Laboratory because he personally knew two aging people who had worked there), but he also is intrigued by the Massacre that brought Goddard from New York to Chicago in the first place. 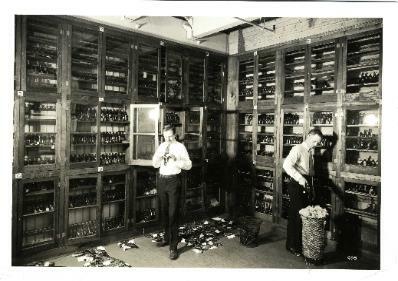 Neal personally knew Joe Wilimovsky and his brother Allan, and when the lab was sold to the Chicago Police Department in 1938 Joe not only helped train science-oriented cops but was delighted to keep much of Goddard's letters, paperwork, some of his guns, and many of their cartridges. Joe also possessed the original Dillinger death mask and mold, as the lab was still operating under Goddard in 1934; and his brother, Allan, who also had worked for Goddard, was instrumental in setting up a similar laboratory in Wisconsin. 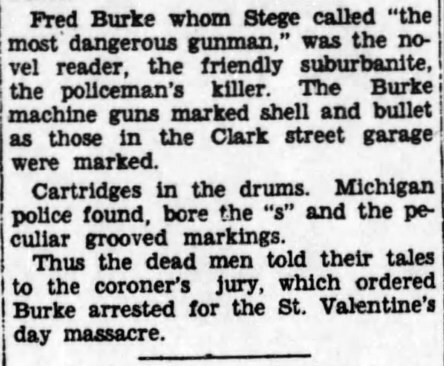 Anyway, because of an unrelated shooting, Michigan police had raided a house belonging to a Frederick Dane, who turned out to be Fred Burke, long presumed to be one of the shooters in the St. Valentine's Day Massacre. Burke, then employed by Al Capone as one of his special -assignment squad known as "the American boys," were mostly from St. Louis and unknown to either the Chicago police or to Capone's rivals. Which suited Mr Capone, who mainly wanted to nail his North Side adversary, Bugs Moran. And he would have but for the screw-up by a lookout across the street who ID'd one of Moran's lieutenants instead. Hence the Massacre, because the shooters didn't know any better and just machine-gunned everybody who happened to be in Moran's North Clark Street garage.Needless to say, such a mass murder freaked out the cops, who arrested every gangster they could find while the actual killers got the hell out of town. Which might have worked except that Fred Burke, probably drunk, banged into another car in St. Joseph, Michigan, the following December and then shot the cop who came over to talk to the drivers. After that shooting Burke escaped, but at his house near St. Joseph (a Chicago gangster lakeside hangout because of its popular Hot Springs) the police turned up a small arsenal that included weapons, boxes of ammunition, and bullet-proof vests.Two of the weapons were Thompson submachine guns, and these, plus boxes of ammunition in various calibers, were taken not to the Chicago police (at least not without telling them) but to Calvin Goddard's new crime lab--where they belonged. And Goddard, after test-firing the guns, established that their bullets matched those taken from victims of the Massacre. 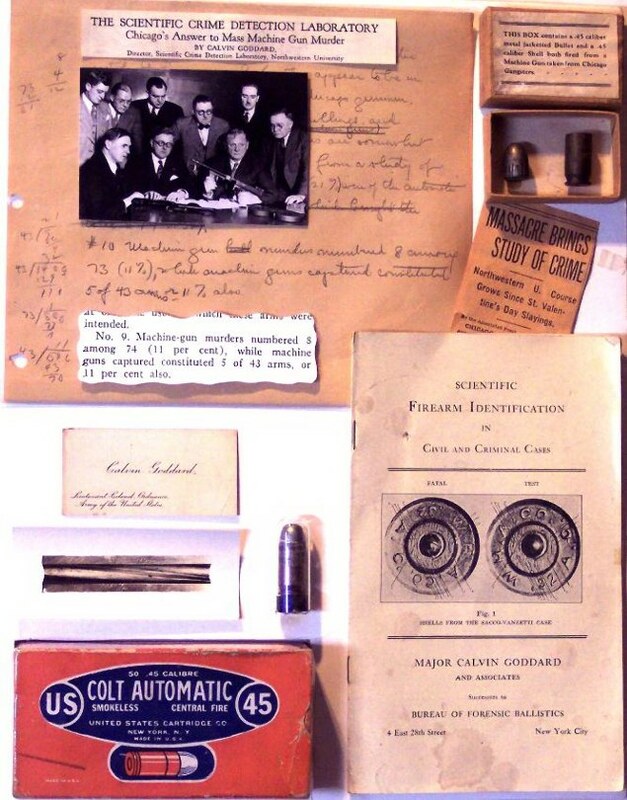 So the items of evidence pertaining to "the Gangland Crime of the Century" were in fact not lost in the police department's basement flood some sixty years ago, as crime researchers have long believed, but have turned up in one of the trunks of materials recently acquired from Goddard's early and long-time employee, the late Joe Wilimovsky. 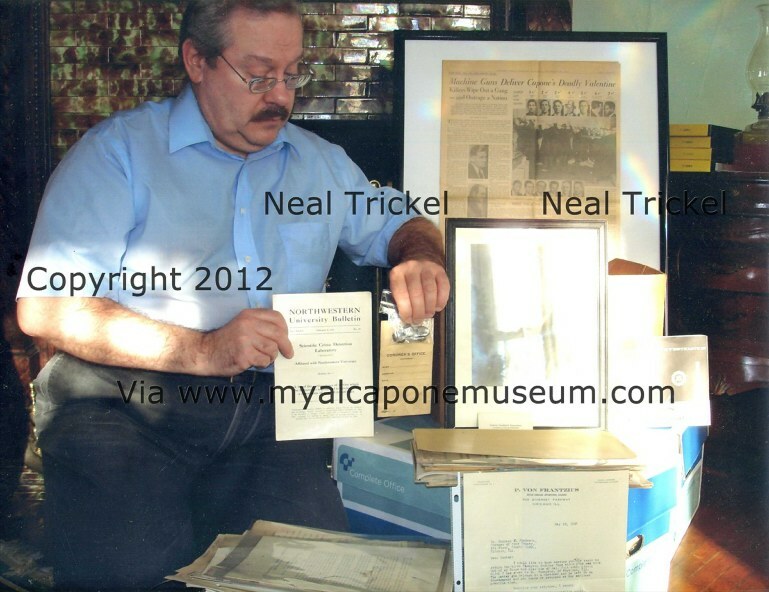 Private Collector Neal Trickel holding his infamous find. The massacre was a crime heard the world over which was impressive considering at a time when there was no t.v. or internet. It gave Chicago a black eye as the real gangster city. So much so, that Lucky Luciano was once have said to exclaim during a visit there "Goddamned crazy place! Nobody's safe in the streets!" he goes through the Wilimovsky stuff only when it surfaces. Like this trunkload of St.
Goddard's letters and other paperwork. All photos and info on this page were graciously supplied by the kindness of collector Mr. Neal Trickel and Mr. William J. Helmer, Author.